What are Deep Blackheads ? 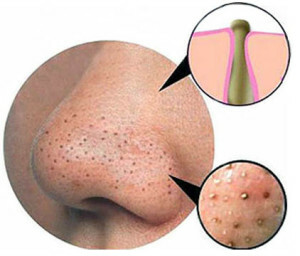 Blackheads generally occur on the face and nose and is a common problem among adolescents and adults with oily skin. Deep blackheads are not caused by dirt, but rather by a tight plug of skin oil, dead skin cells, and bacteria on the skin. Deep blackheads are a real pain and they are not going to disappear overnight. But don’t lose hope as it is possible to remove them by following some simple step in this article how to get rid of deep blackheads. First, wash your face with warm water to remove all the oil and dirt from your face. Now gently scrub your wet face with a clean, soft towel in a circular motion for 5-10 minutes. This will remove all the dead cells from your face and make your skin smoother. Next, pour three glasses of water into a pan and place it on a stove or burner, heating to a boil. Set the pan of boiling water on a flat surface. Place a large towel over your head and place your face, along with the towel over your head, above the pan so the steam directly touches your face. Make sure there is 10-15 inch gap between your face and the pan. Remain in this position for 10-15 minutes to loosen your pores for easier removal of the blackheads (See the image below). Now take a magnifying mirror (at least 15x magnification) and hold it in your free hand; this will help you pinpoint the opening of pores. With a blackhead extractor, place the loop of the blackhead extractor over the blackhead. Press on the extractor using light pressure to take the blackheads out from the loosened pores. However, do not force the blackhead out if it doesn’t come out smoothly. After you have removed several blackheads, rinse the extractor using hot running water and continue the removal process. When you are done removing all the blackheads, wash and rinse your face with cold water to close up your pores. You can also put rose water or an alcohol-free toner over your face to calm your skin. Jojoba Oil penetrates into the skin without clogging pores and is suitable for all skin types. Studies have shown that it has the ability to prevent skin from becoming oily. First, wash your face to remove all dirt and oil. Then put few drops of Jojoba Oil in your hand and rub it on your face gently. This oil will penetrate into the pores. After, massage your face with a warm, wet, soft towel. Repeat the above steps a few times to get those stubborn blackheads out from your face. The main motive of applying Jojoba Oil is to send a message to the pores to stop overproducing sedum (naturally produced oil by your skin) that causes oily skin. The next method in the process of removing deep blackheads involves the use of baking soda. Follow step one as mentioned above then make a paste using baking soda and water. Now gently scrub this paste on your skin for 15-20 minutes. Moisturize this paste frequently if it becomes dry while scrubbing on your face. Follow the same process from Step 6 as mentioned above. Repeat this process at least 2 times a day.